Drifting is a driving technique where the driver intentionally oversteers, with loss of traction in the rear wheels or all tires, while maintaining control and driving the car through the entirety of a corner. The technique causes the rear slip angle to exceed the front slip angle to such an extent that often the front wheels are pointing in the opposite direction to the turn (e.g. car is turning left, wheels are pointed right or vice versa, also known as opposite lock or counter-steering). The sport of drifting is not to be confused with the four wheel drift, a classic cornering technique established in Grand Prix and sports car racing. As a motoring discipline, drifting competitions were first popularized in 1970s Japan, and today are held worldwide and are judged according to the speed, angle, showmanship and line taken through a corner or set of corners. The desired line is usually dictated by the judge or judges, who describe their desired line as well as highlight areas of importance, such as clipping zones, clipping points and touch and go areas. Japan was the birthplace of drifting. It was most popular in the All Japan Touring Car Championship races. The famous motorcyclist turned driver, Kunimitsu Takahashi, was the foremost creator of drifting techniques in the 1970s. This earned him several championships and a legion of fans who enjoyed the spectacle of smoking tires. The bias ply racing tires of the 1960s–1980s lent themselves to driving styles with a high slip angle. As professional racers in Japan drove this way, so did the street racers. Keiichi Tsuchiya, known as the "Drift King" (ドリフトキング, Dorifutokingu), became particularly interested by Takahashi's drift techniques. Tsuchiya began practicing his drifting skills on the mountain roads of Japan, and quickly gained a reputation amongst the racing crowd. In 1987, several popular car magazines and tuning garages agreed to produce a video of Tsuchiya's drifting skills. The video, known as Pluspy, became a hit and inspired many of the professional drifting drivers on the circuits today. In 1988, alongside Option magazine founder and chief editor Daijiro Inada, he helped to organize one of the first events specifically for drifting called the D1 Grand Prix. He also drifted every turn in Tsukuba Circuit in Japan. One of the earliest recorded drift events outside Japan was in 1996, held at Willow Springs Raceway in Willow Springs, California, hosted by the Japanese drifting magazine and organization Option. Daijiro Inada (founder of the Japanese D1 Grand Prix), the NHRA Funny Car drag racer Kenji Okazaki, and Keiichi Tsuchiya gave demonstrations in a Nissan 180SX that the magazine had brought over from Japan. Rhys Millen and Bryan Norris were two of the entrants. Drifting has then since exploded into a form of motorsport in North America, Australia, Asia and Europe. Drifting has evolved into a competitive sport where drivers compete (almost exclusively in rear-wheel-drive cars) to earn points from judges based on various factors. At the top levels of competition, the D1 Grand Prix in Japan pioneered the sport. Others such as Drift Games Extreme (formally known as the IDC (Irish Drift Championship)) in Ireland, Formula D in the United States, World Drift GP formerly Drift Allstars, King of Europe and the British Drift Championship in Europe, WDS in China, RDS in Russia, Formula Drift Asia in the Malaysia/Singapore/Thailand/Indonesia, NZ Drift Series in New Zealand, Australian Drifting Grand Prix and Greek Drift Championship (Drift Wars) have come along to further expand it into a legitimate motor sport worldwide. The drivers within these series were able to keep their cars sliding for extended periods of time, often linking several turns. Drifting competitions are judged based on line, angle, speed, style and show factor. Line involves taking the correct line, which is usually announced beforehand by judges. The show factor is based on many things, such as the amount of smoke, how close the car is to the wall or designated clipping point, giving the crowd's reaction. Angle is the angle of a car and more importantly the turned wheels in a drift, speed is the speed entering a turn, the speed through a turn, and the speed exiting the turn; faster is better. Style is scored on a combination of a rate-to-angle during the initiation, how fluid the car looks through the course, and how committed the driver is through the course. The rate-to-angle is how quickly during initiation or Furidashi (振り出し:starting point) and transitions or Furikaeshi (振替し:transfer) a car gets to its sliding angle. Fluidity is how smoothly a driver maneuvers their car around the course, taking into account the amount of correction that a driver applies through the turn(s), and the smoothness with which the car transitions from one corner to the next. Commitment is about how much throttle the driver applies, and the confidence and dedication the driver shows when approaching track edges and barriers. That is the quicker the driver is able to come to angle, the more speed and angle they can carry through the course, the fewer corrections they apply through the course and the closer they drive to the track edges or barriers, the higher the style score. The judging takes place on just a small part of the circuit, a few linking corners that provide good viewing, and opportunities for drifting. The rest of the circuit is irrelevant, except as it pertains to controlling the temperature of the tires and setting the car up for the first judged corner. In the tandem passes, the lead driver (in the lead car, Senko) often feints their entry to the first corner to upset the chase driver (in the chase car, Atooi), however in some European series, this practice is frowned upon by judges and considered foul play, resulting in deduction of points. There are typically two sessions – a qualifying/practice session, and a final session. In the qualifying sessions, referred as Tansō (単走:solo run), drifters get individual passes in front of judges (who may or may not be the final judges) to try to make the final 16. This is often on the day preceding the final. Overtaking the lead car under drift conditions is OK if the chasing car doesn't interrupt the lead car's drift. Overtaking the lead car under grip conditions automatically forfeits that pass. Spinning forfeits that pass, unless the other driver also spins. Level of smoke from the tires. Increasing the lead under drift conditions helps to win that pass. Maintaining a close gap while chasing under drift conditions helps to win that pass. Points are awarded for each pass, and usually one driver prevails. Sometimes the judges cannot agree, or cannot decide, or a crowd vocally disagrees with the judge's decision. In such cases more passes may be run until a winner is produced. Sometimes mechanical failure determines the battle's outcome, either during or preceding a heat. If a car cannot enter a tandem battle, the remaining entrant (who automatically advances) will give a solo demonstration pass. In the event of apparently close or tied runs, crowds often demonstrate their desire for another run with chants of 'one more time'. There is some regional variation. For example in Australia, the chase car is judged on how accurately it emulates the drift of the lead car, as opposed to being judged on its own merit – this is only taken into consideration by the judges if the lead car is on the appropriate racing line. Other variations of the tansou/tsuiso and the tansou only method is the multi-car group judging, seen in the Drift Tengoku videos where the four car team is judged in groups. The D1GP drift series has been prototyping and fine-tuning an electronic judging system based on custom sensors that record and transmit car data to a computer that judges the run. This system is also being tested in some European series. It is designed to remove subjectivity and/or predisposition of judges. Usually the track for such a system is broken up into several sections (usually three) and the system automatically generates scores based on speed, angle and fluidity of the driver in each section, combining the scores for the final score. In certain situations judges can change or overrule a score, which happens, though rarely. Drift cars are usually light-to-moderate weight rear-wheel-drive coupes and sedans, offering a large range of power levels. There have also been all-wheel drive cars (AWD) that have been converted to rear-wheel drive such as Subaru WRX, Toyota Avensis as Scion tC, Mitsubishi EVO and Nissan GT-R. Early on AWD cars without conversion were allowed in some drifting competitions, usually the rules allowed only a certain percentage of power to be sent to the front wheels, but are banned in most (if not all) drifting competitions today. Despite the export of Japanese Domestic Market (JDM) vehicles to continents outside Japan, drifters in other countries prefer to use local examples as drift cars. A high volume of JDM imports were brought to countries such as Australia and New Zealand, however it is not unusual to see Australian/New Zealand domestic vehicles such as the Holden Commodore or Ford Falcon used in drifting competitions. The American market saw a relatively high volume of JDM cars being imported over the last decade, despite Japanese domestic vehicles being right-hand-drive only. 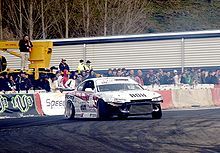 Locally-sold imports such as the Lexus SC and Nissan 240SX feature heavily in American drifting, however they are usually modified with JDM engines to mirror their Japanese domestic equivalents (usually with a Toyota 1JZ-GTE/2JZ-GTE or Nissan CA18DET/SR20DET/RB26DETT respectively). In the UK there are a high level of Japanese imports used within the drifting scene, due in part to the UK sharing a right-hand drive layout with Japan. However, these cars often cost more than UK-market cars, partly due to import costs. There are plenty of UK and European models used as drift cars as well, older BMW's are particularly prominent due to cost and availability, with Volvo 300 series and Ford Sierras also proving popular. In the Formula Drift Professional series, cars range from highly tuned Japanese automobiles reflecting the original styles of drifting, to all new age makes and models. Due to no power limit restrictions in the series, it is not uncommon for competitors to use a variety of different powerplants. Popular variations of Chevrolet "LS" engines are often being seen bolted down to Japanese frames. In the King of Europe Drift Series, the main professional drift series in Europe, BMW models have long ruled the scene, winning event after event, year after year. The most successful models include the E30, E36 and E46, which also present an advantage from a cost point of view, being more affordable than their Japanese rivals. For a few years, BMW V8 engine swaps were the most popular, providing a healthy 300 to 400 horsepower output. But, with the continuous evolution of the sport, these have now become obsolete, making way for the even more powerful American V8 engines or the classical Toyota 2JZ-GTE engine swap. As for 2017, top cars participating in Formula Drift are: Nissan 370Z, Nissan Silvia S14, Nissan Silvia S15, Toyota GT86, BMW E46, Ford Mustang, Mazda MX-5. A mechanical limited slip differential (LSD) is considered essential for drifting. Drifting with an open or viscous differential in a sustained slide generally yields relatively less impressive results. All other modifications are secondary to the LSD. The preferred form of LSD for drifting is the clutch type, in "two-way" form, for its consistent and aggressive lockup behavior under all conditions (acceleration and deceleration). Some drift cars use a spool "differential", which actually has no differential action at all - the wheels are locked to each other. Budget-minded drifters may use a welded differential, where the side gears are welded to give the same effect as a spool. This makes it easier to break rear traction because it reduces maximum traction in all situations except traveling in a straight line. Welded differentials have an inherent risk involved: due to the tremendous amount of internal stress the welds may fail and the differential completely lock up leaving the rear wheels immobilized. Helical torque-sensing differentials such as the Torsen or Quaife (available on cars in certain stock trims such as S15, FD3S, MX-5, JZA80, UZZ3x) are also adequate. It is common for drifters to change the final gear ratio depending on the type of track layout. The clutches on drift cars tend to be very tough ceramic brass button or multiple-plate varieties for durability, as well as to allow rapid "clutch kick" techniques to upset the balance of the car. Gearbox and engine mounts are often replaced with urethane or aluminum mounts, and dampers added to control the violent motion of the engine and gearbox under these conditions. The driveshafts are often replaced with carbon fiber drive shafts as they offer the highest rotational mass savings as well as being stronger than other alternative metals, and flexible enough to absorb and dissipate vibrations, so easing the load on the gear box as well as the rest of the drivetrain. Gear sets may be replaced with closer ratios to keep the engine in the power band, or, on some cars that produce enough power and torque to four-gear transmissions similar to the ones used in NASCAR (such as the Andrews four-speed dog box that Vaughn Gittin Jr. ran in his 2016 Mustang) with more open-ratio gears, this limits the number of shifts the driver has to do during their run. These may be coarser dog engagement straight cut gears instead of synchronised helical gears, for durability and faster shifting at the expense of noise and refinement. Wealthier drifters may use sequential gearboxes to make gear selection easier and faster, while sequential shift lever adapters can be used to make shifts easier without increasing shift time. Steering angles are also crucial as the driver progresses. The first stage of these modifications is usually a modified steering knuckle or upright. Extended control arms can be employed on MacPherson strut vehicles like the Nissan S-Chassis, as to allow for more clearance for higher steering angles. Companies like Wisefab, Driftworks, IRP (Individual Racing Parts), Voodoo13, and Parts Shop MAX have developed full lock kits including modification of the vehicle's original scrub radius, kingpin axis, Ackermann angle, amount of bump steer, caster angle, and kinematics as to maximize front grip and eliminate mechanical bind at steering angles in excess of 60°. While MacPherson strut vehicles are prevalent in profession drifting, Double wishbone suspension vehicles can also be competitive, with often better caster and camber curves. Spring rates and dampers (shock absorbers) are tuned also at higher skill levels, depending on track layout. Typically, dedicated drifting cars are modified to eliminate "Ackermann steering geometry", which is included on almost all production cars. While Ackermann geometry is helpful in making a car turn easier, it inhibits the ability to slide sideways at full lock necessary to compete in drifting. Because of the high centrifugal forces encountered during drifting, drivers are usually retained by a racing seat and five-point harness. This allows the hands to merely turn the wheel, instead of bracing the body in the seat. The same applies for the feet, which are free to move rapidly between clutch, brake and accelerator pedals. The steering wheel is usually relatively small, dished, and perfectly round, so that it can be released and allowed to spin through the hands as the caster returns the front wheels to center. The locking knob on the hand brake is usually replaced with a spin turn knob; this stops the hand brake locking on when pulled. Nearly all drivers move the hand brake location or add an extra hydraulic hand brake actuator for greater braking force. Additional gauges used to monitor boost levels, oil pressure and temperature, intake and coolant temperatures, air-fuel ratio (also called λ, or "lambda" ratio), etc. Some drivers, especially in larger cars, move the seating position for a better weight distribution, such as Daigo Saito's 2014 JZX100 Mk.II Chaser. S13 Silvia - tire stretched over a wide rim, increasing sidewall rigidity. The rim has a low offset to increase track. In the United States, competitive drifters are required to run US DOT-approved (road legal) tires similar to racing slicks in rubber composition, but with shallow treads included. This is permitted, with the exception of some major championships including D1GP and Formula Drift which only permit commercially available tires that are approved by the sanctioning body. Professional drifting has come to the point where grip is tuned into cars to be defeated. It makes for a faster drift necessary in the current professional climate. Tires typically used by drifters are around the DOT treadwear rating of 200. Examples include the Hankook Ventus RS-3, Falken Azenis RT615K, Nitto NT05, Yokohama ADVAN Neova AD08R, and Achilles Radial 123s. Some other companies from Asia have also started developing their technology through sponsoring professional drivers. These companies include Nankang , Westlake and Zestino. Tires are often modified with lettering to give them a more customized look. R/C drifting refers to the act of drifting with a radio-controlled car. R/C cars are equipped with special low grip tires, usually made from PVC or ABS piping. Some manufacturers make radial drift tires that are made of actual rubber compounds. The car setup is usually changed to allow the car to drift more easily. R/C drifting is most successful on 4WD (four wheel drive) R/C cars. Companies such as Tamiya, Yokomo, MST, Team Associated, and Hobby Products International have made drift cars and supported the hobby. Hollywood embraced the drifting subculture in the film The Fast and the Furious: Tokyo Drift, which depicts drifting. Paul Newman's character Doc Hudson, a 1951 Fabulous Hudson Hornet in Cars (2006), uses drifting techniques on a dirt track in the desert to demonstrate his skills to skeptical NASCAR rookie Lightning McQueen. Drifting’s popularity in computer games extends back to early arcade racers where the techniques for games such as Sega Rally and Ridge Racer involved drifting. The technique is now considered mainstream in modern games in all their forms. In-game communities have developed games such as Assetto Corsa, Forza Motorsport and Gran Turismo, made up of teams who battle in user-created tournaments. Drifting also features heavily in the Need for Speed franchise (notably games since Need for Speed: Underground), the Grid franchise, the Juiced franchise and in Japanese domestic console games such as Initial D: Extreme Stage (PS3), which is based solely on drifting. Drifting and the related technique of powersliding feature heavily in the Mario Kart franchise, where a successful drift or powerslide around corners will award the player with a short nitrous oxide boost known as "mini-turbo". Similar gameplay mechanics also exist in games from the Asphalt series, where drifting and other fast-paced vehicular maneuvers are a recurring theme. Browser-based games include NZ Performance Car's Drift Legends (the first online game to feature real racetracks, and now ported to iPhone/iPod touch) and Mercedes-AMG’s Wintersport Drift Competition (the first manufacturer-backed drifting game). Drifting games for mobile devices are readily available from major developers and independent studios. High Performance Imports. Volume 10 features Australian journalists from express publications, and Australian professional drifter Darren Appleton traveling to Japan, purchasing a drift vehicle (Nissan R32 GTS-T four-door), traveling with the likes of D1 champions and entering a drift event. Tafheet—illegal street drifting in Arab countries. ^ Abdulrahim, M. (2006). "On the Dynamics of Automobile Drifting". University of Florida. doi:10.4271/2006-01-1019. ITSD. Archived from the original on 2012-10-16. ^ McKirdy, Andrew (October 4, 2017). "Drifting: Japan-born street sport roars onto global stage". The Japan Times. Retrieved 18 July 2018. ^ Banner, Justin. "The History of Drifting and The Future of Formula Drift". MotoIQ. Retrieved 18 July 2018. ^ "The Legendary Toyota AE86 and the Origins of Drift Racing". GaijinPot. July 2, 2013. Retrieved 18 July 2018. ^ Dixon, Chris (May 7, 2004). "DRIVING; Drifting: The Fast Art of the Controlled Slide". The New York Times. Retrieved 18 July 2018. ^ lnsania (6 August 2007). "Keiichi Tsuchiya - Pluspy (part 1)". Retrieved 29 March 2017 – via YouTube. ^ "How drifting is judged". Youtube.com. Retrieved 2011-08-08. ^ "One More Time (OMT)". Formula D. Retrieved 15 July 2014. ^ Drift Mania! Inaugural D1 Grand Prix presented by Yokohama August 31, 2003, Turbo Magazine. Retrieved August 25, 2007. ^ "Australian Drifting Grand Prix sporting regulations, section 2.10.1 Judging Criteria - Drift Battles". Archived from the original on 16 March 2017. ^ "Australian Judging". Track Battle. Archived from the original on 15 July 2014. Retrieved 15 July 2014. ^ "Ford Typhoon Drifting Car - Page 2". ZerCustoms. 19 September 2006. Archived from the original on 10 October 2011. Retrieved 8 August 2011. ^ "What is Drifting?". DriftWorks.com. Retrieved 29 March 2017. ^ "Article on Trampdrift - What to buy". Trampdrift.eu. Retrieved 29 March 2017. ^ Ellis, Ben; et al. (2004). Drift Battle 1. Express Motoring Publications. p. 24. ^ Ellis, Ben; et al. (2004). Drift Battle 4. Express Motoring Publications. p. 22. ^ Ellis, Ben; et al. (2005). Drift Battle 12. Express Motoring Publications. p. 77. ^ Ellis, Ben; et al. (2004). Drift Battle 1. Express Motoring Publications. pp. 53–56. It might surprise some people to see this listed first, but a proper mechanical limited-slip diff is absolutely essential for drift. ^ "SPEED HOLES AND METHANOL: Daigo Saito's 2014 JZX100 : NORIYARO". noriyaro.com. Retrieved 29 March 2017. ^ "1/10 R/C Nismo Coppermix Silvia （TT-01D） Drift Spec". Tamiya.com. 2007-03-08. Retrieved 2011-08-08. ^ "Online games, technology news and reviews | » Drift Legends v2 drifting game released on iTunes". Tone.co.nz. 9 February 2011. Archived from the original on 24 July 2011. Retrieved 8 August 2011. Wikimedia Commons has media related to Drifting.